In our travels this summer we found ourselves crossing the Penobscot Narrows bridge on our way to Bar Harbor, Maine. I took this shot as I drove over the bridge not knowing if I had captured a good image or not. Once viewed… the title “Heaven’s Gate” was a must!!! Penobscot Narrows Bridge & Observatory is a cable-stayed bridge over the Penobscot River in Prospect, Maine. 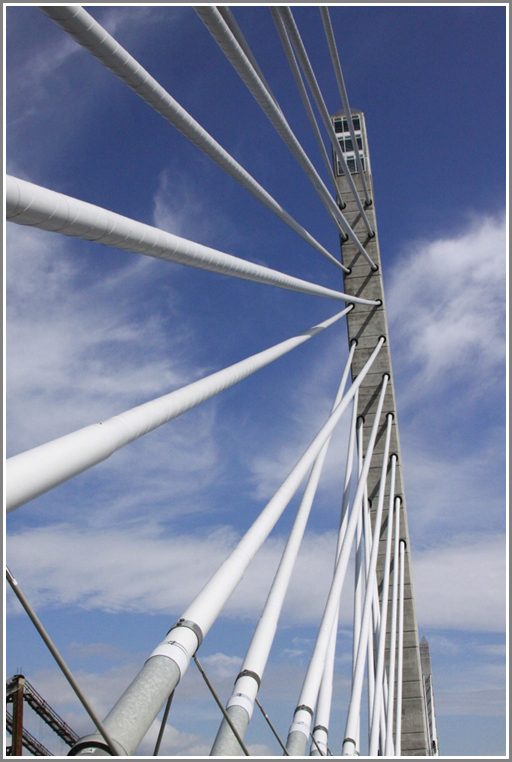 The engineering innovations that was build into this bridge helped it appear in the Dec. 2006 edition of Popular Science as one of the 100 best innovations of the year. The Observatory within the bridge is the first bridge observation tower in the U.S. and the tallest public bridge observatory in the world.